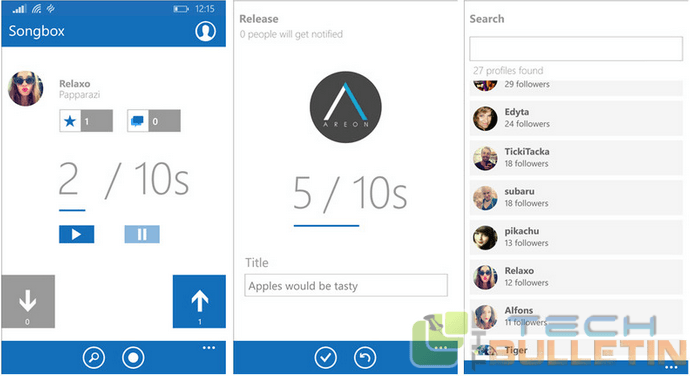 Songbox is the new music app launched today for Windows Phone and it hopes to add a musical twist to social networking. It is very simple and interesting app which allow you to record 10 seconds of your favorite song and share the song with other Songbox members to rate it. The twist in the app is that the recording your own song bit, but not your favorite song/artist. It comes across as a terrific way to share your pipes with others and check out rest of the talent out in the world. To use this you need to sign up for Songbox membership which is free of cost to upload the songs but voting the song doesn’t require a membership. After launching the Songbox app, you will be greeted with the members song and like or dislike the song. After voting another tune will appear in the app. After your membership get established, you can setup a user profile and upload your own song bits. You can record the songs upto 10 seconds and there is no limit for uploading song snippets. Songbox lets you to follow the members and any songs uploaded will be shared with your followers instantly. You can connect other users and comment or like their songs and lend and get the points by upvoting their songs. Songbox best suits for the bathroom singers and when they sing nobody around. It is the best fun and entertaining app which is available for free.